George Graham Reviews Cameron Mizell's "Negative Spaces"
For many, term jazz-rock fusion evokes the electric music of the 1970s in the Mahavishnu Orchestra or Weather Report mode. But in the decades since then, the genre has become a good deal more diverse, and runs the spectrum from the rock side to the jazz side. The jam band scene has added more musical paths for the electric instrumentalist to follow. This week we have an interesting record by guitarist Cameron Mizell that evades stereotypes. It’s electric but melodic, and with a three-piece group surprisingly wide-ranging in its sound. The album is called Negative Spaces. Cameron Mizell is a Brooklyn-based guitarist in his mid 30s, who was born and raised in St. Louis. He studied music at the University of North Texas and Indiana University, both of which are known for their music programs in jazz. Since he has been in New York, Mizell has taken the role of a versatile journeyman player, performing with rock and funk bands as well as in the pit orchestras for Broadway shows. He is also a busy private music instructor, sometimes teaching students with on-line video links. And he has worked on the business side of music, with a position at Verve Records, and then as label manager for Destiny Records. He released his first album, with an eight-piece group, in 2004. Though his orientation was mainly in jazz and funk, his jobs a sideman had him playing accompaniment to folksingers, and in rock bands. That range of influence is evident on Negative Spaces, where the music runs from funk to what sounds like instrumental versions of country ballads, with a degree of spaciness. Mizell is joined by Brad Whitely on keyboards, who has released jazz-oriented recordings under his own name and drummer Kenneth Salters. The keyboards provide most of the bass, and sometimes Mizell will overdub additional guitar parts. On his website, Mizell says that he tried a different approach to composition for his album. Rather than starting with a rhythmic groove and riffs as he has done in the past, and working from the “bottom up” as he describes it, for this record, he wanted to build the compositions from the top down, starting with melodic lines. So this album, as fusion records go, is very tuneful, with music one can come away humming. The album is also appealing for its range of textures. Mizell’s guitar work runs from the acoustic to the warm sound of jazz guitar to more electric sounds, but no real guitar shredding, as one used to hear in fusion records. Brad Whitely uses a variety of keyboards subtly, mostly vintage sounds like Hammond B3, Rhodes or Wurlizter electric piano and even some acoustic piano. Kenneth Salters plays in a laid back, jazz style with cymbal work being prominent, but he is not afraid to kick into rock or funk lines. Adding further to the interest is the fact that several of the tracks segue into one another to make a continuous piece, like the old days of the concept album. 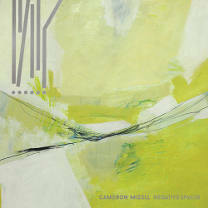 Cameron Mizell’s new album Negative Spaces, whose title was inspired by the liner notes in the CD, which go on about how space in music can be as important as the notes played, is an excellent instrumental fusion recording that demonstrates versatility and presents music that is more tuneful than most jazz-rock fusion records. Both the composing and the playing are first-rate, avoiding cliches and remaining quite tasteful throughout. There is also a degree of subtlety to the album that might not make it stand out immediately, but it’s definitely a record that you will find will grow on you, as it did me. Our grade for audio quality is an A-minus. The sound is warm and clean and everything is in the right place in the mix. But we have the usual complaint about restricted dynamic range from the unnecessary compression added to jack up the volume artificially. This kind of wide-ranging but subtle fusion is turning up more frequently these days with albums by Bill Frisell and The Unknown New. Negative Spaces by Cameron Mizell continues this interesting trend, and in the process results in an album that is musically absorbing but quite appealing.